As I write this the global stock markets have shed $4.3 Trillion in the last 10 trading days! It’s pretty clear that Financial Disaster looms here in the U.S. I wrote a month ago that all the dysfunctions that caused the horrendous crash of 2008/2009 still persist, perhaps even in magnified form. In addition the our inability to come up with a sensible government plan to lift us out of an imploding demand-based recession now ensures that we will head to economic suicide. Even the mild reform of the banking sector, whose excesses were largely the cause of the $20+ trillion debacle, passed last year as The Dodd–Frank Wall Street Reform and Consumer Protection Act has been now killed by the coalition of big bank lobby money and our willing and complicit right-wing pols. But enough venting. I want to write about some ideas on how to invest in this environment while protecting yourself from ruin. As you know I believe that in the long run if you invest in America’s largest and most globally diversified companies (in the form of the 30 Dow Jones Industrials) you will beat almost every other strategy. You are very, very likely to get double digit annual returns over a complete economic cycle or a 10-20 year investing horizon. See my post here on why and how to invest in the Dow Index. But in the near future the clouds of doom loom – it would not surprise me if the Dow falls 20%, 30% or even 50% in a horrendous double dip recession or even a protracted depression. So what can you do? 1. The crash may not come soon. The Fed could monetize the debt or we could have a long lasting bubble as QE3 through QE10 happen. No one can time these things. What if the bubble lasts another 3-4 years – you’ll be sitting in zero-return cash while the Dow soars. 2. Even if the crash comes soon, will you be nimble enough to get in at the bottom? What if the Dow were to fall 25% in the next month, would you jump in? It could fall another 25% after that there’s no way to predict the bottom. You have to have a definite strategy to make sure you don’t miss the rebound and you can’t trust your instincts. Remember not even the pros can time the market. Another strategy – buy lots of gold and watch the inevitable decline of the dollar and market crash happen. Again, I don’t think so. Gold has a huge psychological premium already, so you are paying a lot for this hedge. You won’t know what is a good level to unwind your hedge. So what should your strategy be. I say that if you have a long term horizon (say you are building an IRA) keep investing at regular intervals in the Dow and ride out the coming crash. You will get 3% dividends while you wait (vs 0% in cash). You will also dollar cost average if the Dow goes down and your dividend may be higher as a percentage as the Dow declines. If a protracted bubble happens you will ride it upwards (vs cash) and still do better in a crash than being on the sidelines. Remember cash and bonds are virtually sure losers to inflation, specially if we end up monetizing our debt, which, I think, is our only viable option in the long run. In a high inflation environment the large cap, global companies of the Dow might actually do well with some pricing power than their competitors. Expected (or median) value of your return: about 5.5% per annum. Downside if the Dow fell a drastic 50% over 2 years and you were dollar cost averaging, assuming a 3% dividend – about 12.5% of your capital. Even this would recover if you don’t have to cash in at the bottom. If the Dow came back to only a 25% loss from today you would break better than even. Return if the Dow dropped 30% and stayed there at the 5-year mark: 0% – 5%. You would do better than cash! There is yet another way that I have been looking at where you may be able reduce risk further while still participating in the Dow power engine. It uses the predictive power of the VIX, a volatility index, that spikes when the Dow is falling and declines when the markets are stable. I know this is market timing, but the volatility does seem to have some short term predictive power. The key word here is short-term. It is a good predictor for 15-30 days and fair up to 1 quarter.. If the VIX is higher than the quarter before (bearish forecast) don’t do anything. 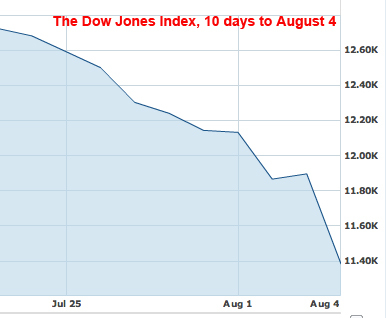 If the VIX is lower than the quarter before (bullish forecast) buy $12,000 worth of Dow. That’s it. You will ultimately be fully in the Dow. As you have new money to invest, such as dividends or other income, do the same thing at the next 1st of the month. In the last 5 years only 10 buy signals occurred (the Dow chart above shows those signals as red arrows) so it will take you some time in bad markets to be fully in the Dow. Using this strategy you will materially reduce downside wipeout risk and retain most of the advantage of the Dow’s inherent power surge. For even better results do this monthly, because the VIX is a great predictor 1 month out. Want to be even more aggressive? When the VIX rises more than 20% in any period sell $12,000 or whatever your installment is. This will further get you out during down times. Other variations of this basic concept are possible depending on your risk tolerance. I tested this approach and it reduces ruin risk in down markets considerably, while retaining a large percentage of the Dow returns (historically 11% annually).